Ruins and memories are all that remain of the place once called Terminal Farm and the meadows next to it. The farm once supplied produce to feed the crowds who flocked, or maybe that should be steamed, to the holiday resort that was Bowen Island. Although only its footprint remains, the site retains enough significance to be part of the proposed Heritage Inventory of Bowen Island. In the 1880s lots 490 and 491on Bowen Island were owned by Joseph Mannion, owner of the Granville Hotel on Water Street in Granville (later called Vancouver). Mannion had the foresight to move to his holdings on Bowen Island and sell his hotel just before he 1886 fire that consumed the hotel and most of the city. As the Terminal Steamship Line became successful Cates expanded his operations to include the Terminal Hotel. Then he brought Terminal Farms into the mix and increased its output to supply the hotel and steamships. The land holdings increased and about 1905, Robert Green and James Collins were hired by the Terminal Steamship Co. to clear the "Meadow". Mr. Collins had a team of horses and a Japanese crew were hired to assist. The Japanese crew lived in bunk-houses on the south side, just above Terminal Creek. Captain Cates sold his company to the Union Steamship Company of B.C. in 1920.
and store. Originally, their cattle were driven from their home up in the Grafton (formerly Trout) Lake Valley, to the Meadow every day. Their daughter Marjory drove them to the meadow on the way to school and back again after school. Around 1939 the U.S.S. Co. built a cattle barn, and later a house and a dairy, in the meadow for the Lister family and John Lister held a party for the community in the Lower Dance Hall to celebrate their move. As part of the dairy operation the Listers also used a big hay barn beside what is now the Killarney Lake Trail. That barn may have been built during Captain Cates time to store hay from the Meadow. The U.S.S. riding stable moved to the Meadow in the 1940s, after the Listers had left, using the Lister’s cattle barn for the horses. The Terminal barn and silo were close to what is now Lenora Road. The vegetable part of both the Terminal and Union SS farms was never in the Meadow, but within the area surrounded by the loop of Lenora Rd. Both companies had chickens, but I think only Terminal farm had pigs. They both used big work horses for the farm as well as for transport. I do not think that either of them had sheep and goats. The U.S.S. Co. had a riding stable with horses which was originally near the old Terminal barn. During the U.S.S. Co. times, the original Terminal cow barn was used to keep a team of horses and various wagons and later trucks. The dairy operation must have been close to the barn, and one has to assume that the cattle were driven to and from the Meadow daily, over a maple tree lined wagon road which is now the Killarney Lake Trail. Since the area became a part of Crippen Park, Killarney Creek has been allowed to overflow and expand. The meadow area alongside Killarney Trail has now been overgrown by alders and flooded. Earlier, it extended as far as the trail. It is often hard to picture places as they once were, bustling and important, a proud and necessary part of a larger community when time has moved on. When all that is left are the silent remains of a building or a landscape we look to the knowledge of their history and the recollections of those that remember what they used to be to bring such sites back to life again. Information for the story about Terminal Farms at the Meadows was obtained from Marion Moore and from Volume 7 of “Early Vancouver” available through the Vancouver Archives. 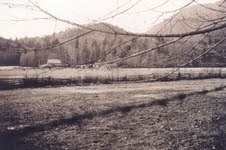 Thank you to the Bowen Island Historians Museum & Archives for the use of their photo of the Lister farm.